It is a rain or any other form of precipitation that is unusually acidic, meaning that it possesses elevated levels of hydrogen ions (low pH). It can have harmful effects on plants, aquatic animals, and infrastructure. 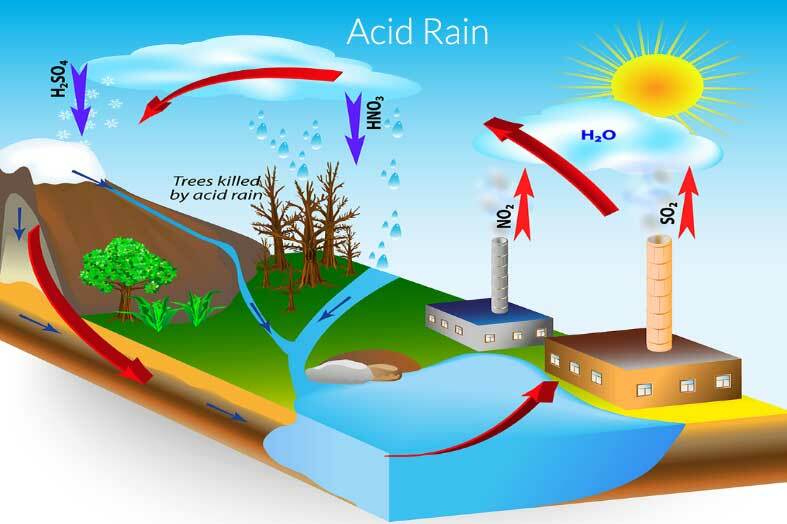 Acid rain is caused by emissions of carbon dioxide, sulfur dioxide and nitrogen oxides which react with the water molecules in the atmosphere to produce acids. The chemicals in acid rain can cause paint to peel, corrosion of steel structures such as bridges, and erosion of stone statues. The principal cause of acid rain is sulfur and nitrogen compounds from human sources, such as electricity generation, factories, and motor vehicles. Coal power plants are one of the most polluting. The gases can be carried hundreds of kilometers in the atmosphere before they are converted to acids and deposited. Both the lower pH and higher aluminium concentrations in surface water that occur as a result of acid rain can cause damage to fish and other aquatic animals. At pHs lower than 5 most fish eggs will not hatch and lower pHs can kill adult fish. As lakes and rivers become more acidic biodiversity is reduced. Acid rain has eliminated insect life and some fish species. Soil biology and chemistry can be seriously damaged by acid rain. Some microbes are unable to tolerate changes to low pHs and are killed. High altitude forests are especially vulnerable as they are often surrounded by clouds and fog which are more acidic than rain. Acid rain can also damage buildings and historic monuments and statues, especially those made of rocks, such as limestone and marble, that contain large amounts of calcium carbonate. Mass of gases surrounding the heavenly body especially the earth. The atmosphere of Earth is a layer of gases surrounding the planet Earth that is retained by Earth’s gravity. Atmospheric stratification describes the structure of the atmosphere, dividing it into distinct layers, each with specific characteristics. Air is the name given to atmosphere used in breathing and photosynthesis. Dry air contains roughly (by volume) 78.09% nitrogen, 20.95% oxygen, 0.93% argon, 0.039% carbon dioxide, and small amounts of other gases. Air also contains a variable amount of water vapor, on average around 1%. An indicator species is any biological species that defines a trait or characteristic of the environment. For example, a species may delineate an ecoregion or indicate an environmental condition such as a disease outbreak, pollution, species competition or climate change. Indicator species can be among the most sensitive species in a region and sometimes act as an early warning to monitoring biologists. A species whose presence indicates the presence of a set of other species and whose absence indicates the lack of that entire set of species; a species that indicates particular environmental conditions such as certain soil or rock types. The biosphere is the global sum of all ecosystems. It can also be called the zone of life on Earth. The immediate part between atmosphere and geosphere in which living organism are present. Primary succession is one of two types of biological and ecological succession of plant life. If the development begins on an area that has not been previously occupied by a community, such as a newly exposed rock or sand surface, a lava flow, glacial tills, or a newly formed lake, the process is known as primary succession. Seeds, roots and underground vegetative organs of plants may still survive in the soil. Secondary succession is usually more rapid as the colonizing area is rich in leftover soil, organic matter and seeds of the previous vegetation, whereas in primary succession the soil itself must be formed, and seeds and other living things must come from outside the area. Ecesis: It involves establishment and initial growth of vegetation. Colonization (or colonisation) occurs whenever any one or more species populate an area. In biology, an ecocline or simply cline describes an ecotone in which a series of biocommunities display continuous gradient. More technically, clines consist of ecotypes or forms of species that exhibit gradual phenotypic and/or genetic differences over a geographical area, typically as a result of environmental heterogeneity. Rhizobium is a soil bacteria that fix nitrogen. Rhizobium forms an endosymbiotic nitrogen fixing association with roots of legumes. The bacteria colonize plant cells within root nodules; here the bacteria convert atmospheric nitrogen to ammonia and then provide organic nitrogenous compounds such as glutamine or ureides to the plant. The plant provides the bacteria with organic compounds made by photosynthesis. A mycorrhiza is a symbiotic association between a fungus and the roots of a plant. In a mycorrhizal association, the fungus colonizes the host plant’s roots.Mycorrhizas form a mutualistic relationship with the roots of most plant species. This mutualistic association provides the fungus with relatively constant and direct access to carbohydrates, such as glucose and sucrose. The carbohydrates are translocated from their source (usually leaves) to root tissue and on to the plant’s fungal partners. In return, the plant gains the benefits of the mycelium‘s higher absorptive capacity for water and mineral nutrients due to the comparatively large surface area of mycelium: root ratio, thus improving the plant’s mineral absorption capabilities. Plant roots alone may be incapable of taking up phosphate ions. The mycelium of the mycorrhizal fungus can, however, access these phosphorus sources, and make them available to the plants they colonize. Mycorrhizas are commonly divided into ectomycorrhizas and endomycorrhizas. The two types are differentiated by the fact that the hyphae of ectomycorrhizal fungi do not penetrate individual cells within the root, very common in nature while the hyphae of endomycorrhizal fungi penetrate the cell wall and invaginate the cell membrane. Ectomycorrhizas, or EcM, are typically formed between the roots of around 10% of plant families.Roots with mycorrhiza are unbranched, without root caps and root hairs. In genetics, a mutagen is a physical or chemical agent that changes the genetic material, usually DNA, of an organism and thus increases the frequency of mutations above the natural background level. As many mutations cause cancer. Mutagen causes changes to the DNA that can affect the transcription and replication of the DNA, which in severe cases can lead to cell death. The mutagen produces mutations in the DNA, and deleterious mutation can result in aberrant, impaired or loss of function for a particular gene, and accumulation of mutations may lead to cancer. A carcinogen is any substance, radionuclide, or radiation that is an agent directly involved in causing cancer. Several radioactive substances are considered carcinogens, but their carcinogenic activity is attributed to the radiation, for example gamma rays and alpha particles, which they emit. Common examples of carcinogens are inhaled asbestos, certain dioxins, and tobacco smoke. Carcinogens may increase the risk of cancer by altering cellular metabolism or damaging DNA directly in cells, which interferes with biological processes, and induces the uncontrolled, malignant division, ultimately leading to the formation of tumors.